You can get access to our many years of experience building and managing construction of virtually every type of log home, including homes as large as 6600 square feet and as small as 352 square feet. Our log cabin construction services include “dry-in” services focused on building just the basic log structure and external shell as well as a “turn key” service that involves all aspects of construction of a finished log home or cabin. A combination of services that might include work on log home interiors and finishing details is also common. Managing offloading, receipt and inspection of the log package. 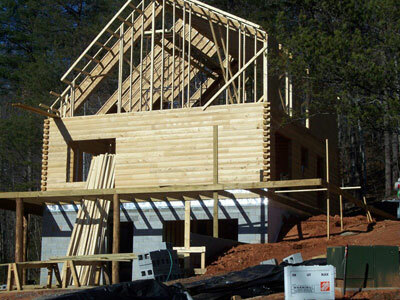 Construction labor, equipment and supervision of assembly of the log package, including all exterior portions of the log home, according to design plans and drawings. Installation of window, exterior doors and roofing. Installation of first level sub-floor and porch decking if required. Site clearing, grading and foundation. Exterior and Interior Log Chinking. When Performance Log Finishers manages construction of a log home as a turn-key project Contact Performance Log Finishers, call 800-781-2551 or email us.